Butano State Park Campground (Ben Ries campground) is located smack dab in the middle of a beautiful redwood forest. The campground has 21 drive-in campsites for tents, trailers and RVs, and another 18 walk-in (tent) campsites. The walk-in campsites have a parking area and you’ll need to haul your gear about 20 to 50 yards to the campsites. Campsite #12 is the “hike/bike” campsite area. Lastly, there are 8 trail campsites for backpackers about 5.5 miles from the park entrance. Each campsite has a table, foo storage locker, fire ring and grill. The campground has drinking water, flush toilets and a campfire center. The trail/backpacker campsites have a pit toilet. Check in time is 2pm and check out time is 12PM. Visitors without reservations can self-register for one night only into an unreserved campsite (if available). Butano State Park is located in the Santa Cruz Mountains and includes 4,728 acres of canyons, meadows, redwoods, oaks and even a wet riparian and chaparral ecosystem. Wildlife abounds along the 40 miles of hiking trails where you can view the Pacific Ocean. Outdoor activities include camping, hiking, biking, horseback riding, picnicking and wildlife viewing. Don’t forget to swing by the visitor center located at the park entrance. You’ll see exhibits about local flora, fauna and wildlife. 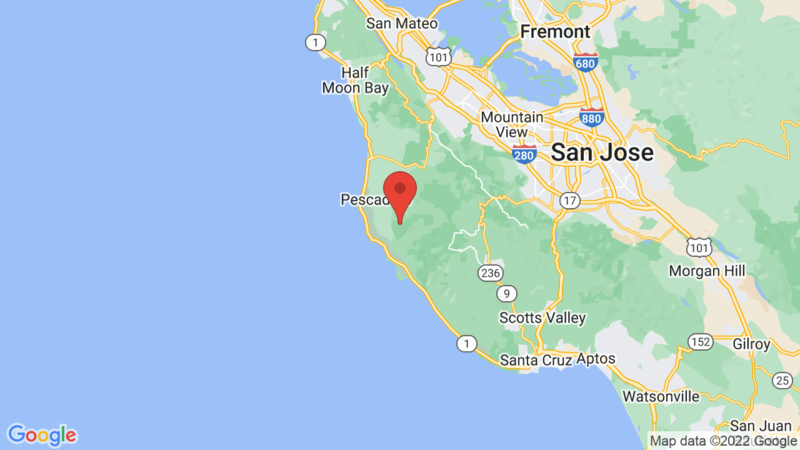 Big Basin Redwoods State Park is another option (about 40 miles away) if you want to camp in the Redwoods. Visted Butano State Park Campground lately? We'd love to hear about your adventure. Did you find us useful? Did we forget something? Anything our community should know before heading out to Butano State Park? 6/18/17. Visited for first time. Hiked 6 bridges and Goat Hill trails. Beautiful and most importantly…..QUIET! Will be back. Have to love those banana slugs! Will rent a cabin next time we are there. Highly recommended. There are no cabins available in Butano State Park. Can anyone tell me if site reservations in 2018 are able to be changed at arrival, or is the reserved site number exactly what you get when you arrive? Also, I have a walk-up site, number 33,and was wondering how far it is from where we would be unloading our car. Is there a way to drive kind of close, unload, and then drive to park? Any advice is appreciated! Judging from Butano State Park Campground Map – it’s about 300 feet (from parking area to campsite 33 – via the trail). And you can ask the Ranger at check in if there are sites available (not reserved) during the time you want to stay. If so, and the price is the same, they may switch you to another site. Just not sure if the Ranger is able to access the reservation system to indicate the new site (you changed to) is now taken. Is the bike/hike site first/first? Yes – the bike/hike campsites are first-come first-serve at Butano State Park. I am planning a motorcycle camping trip and I was wondering where the first come first serve campsites mentioned above were? Are they campsites that I can park my bike on the side of the road and hike to? 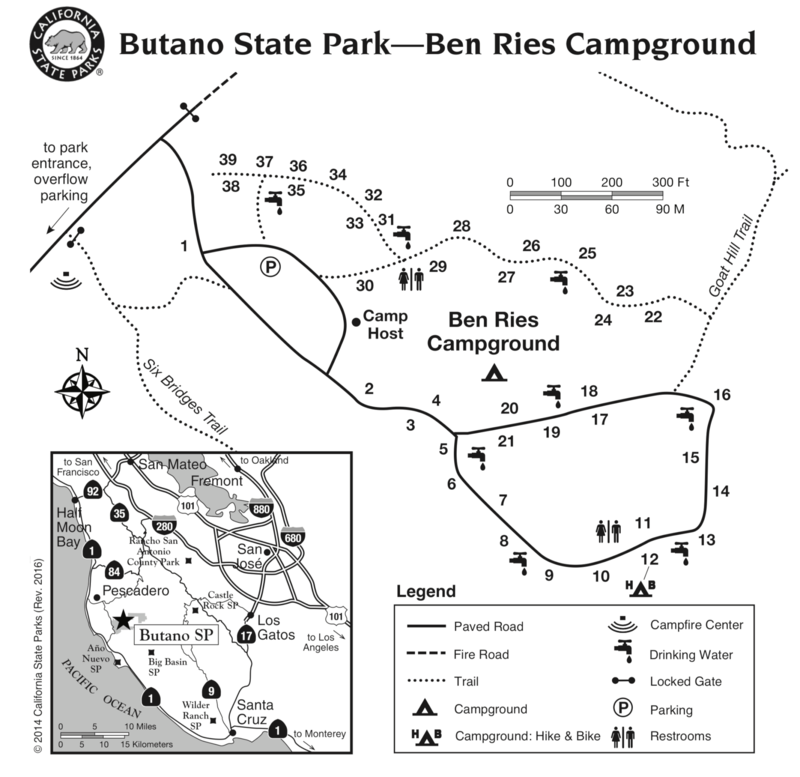 Butano State Park has 18 walk-in campsites and there is a parking area. You’ll need to haul your gear about 20 to 50 yards to the campsites. Campsite #12 is the “hike/bike” campsite area and it has a small parking area as well). Unfortunately we do not have a photo of campsite #12. Lastly, there are 8 trail campsites for backpackers about 5.5 miles from the park entrance. Is the correct pronunciation of this lovely park Byoo-TAH-noh, or BYOO-tuh-noh? The latter was told to us by a docent at the nearby lighthouse — was she pulling our leg?